Newspaper Rock: Repeated stereotypes become the "truth"
By Ajinur Setiwaldi The point of Carstarphen’s book is not to eliminate historic and cultural images of American Indians but to depict them in a contemporary light in modern media, Carstarphen said. The media is a powerful force in the development of ideas and images, Carstarphen said. “If these things are repeated over and over again through mass media, the rest of us accept them as the truth,” Carstarphen said. The media influences how we identify people, and the imagery associated with American Indians through the media is stuck in the past, Sanchez said. Carstarphen said that their work also looks to media issues through a historical lens. American Indians were perceived as threats and obstacles to expansion, and our media tried to justify the atrocities against American Indians by creating a certain image of them, Carstarphen said. “Our media depicted them as savages, heathens or simplistic,” Carstarphen said.Comment: Carstarphen has it exactly right. "The media is a powerful force in the development of ideas and images"...bingo. 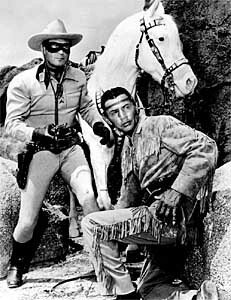 For more on the subject, see Why Tonto Matters and Thousands of Indian Movies and TV Shows. Below: The mass media teaches a generation that Indians are secondary and servile to the white man. Note that it doesn't matter which tribe Tonto comes from or whether his costume is authentic. The overall Native theme is that Indians are less important than whites. And that's something most viewers won't question as a fiction.